NOTED FOR what he does when not paying the bills. Ostapuk is the Arizona director of the Old Spanish Trail Association, a member of the Glen Canyon Natural History Association and - since 1997 - a senior board member of Friends of Lake Powell, a pro-Glen Canyon Dam nonprofit based in Page. After the rapids in Utah's Cataract Canyon, long past the confluence with the Green River and long before the looming concrete pile of Glen Canyon Dam - that's where the Colorado River begins to spread out into Lake Powell. On a hot August day here in 2006, two dozen anti-dam activists culminate a four-day rafting trip led by the Glen Canyon Institute, an organization founded in 1996 by Rich Ingebretsen and David Brower with the primary goal of draining Lake Powell. Also along on the trip is Paul Ostapuk, a guy who not only loves the dam, but whose livelihood depends on it. He's a member of Friends of Lake Powell, a group with one purpose: preventing the Glen Canyon Institute from doing away with the dam. As the seven boats slide from frothing whitewater to placid reservoir, Ingebretsen's young crew lashes them together and revs up the outboards, all the while muttering about "Reservoir Powell." But Ostapuk avoids the bait. Instead, he sets down his paddle, cracks open a Coors Light and chats with Ingebretsen and company about canyon geology, archaeology and climate change, peppering the talk with brief anecdotes from his past three decades of hiking, boating and rafting adventures on the Colorado Plateau. But Ostapuk sees more common ground than he lets on. At one time, he also hated Glen Canyon Dam. Ostapuk's affinity for the outdoors began at an early age. In 1958, when he was 2, a freak snowstorm transformed his Tucson backyard into a winter wonderland - on the same day his sister was born. "Ever since," he says, "weather forecasting has been my first love." During the 1970s, Ostapuk studied meteorology and engineering at Northern Arizona University, went camping a lot, and became a big fan of Ed Abbey's eco-saboteurs in The Monkey Wrench Gang. "But my first reluctant visit to Lake Powell opened my eyes," Ostapuk recalls, "I saw the recreation and economic benefits - and the desire to capture melted snowflakes." After college, the 710-foot-high dam provided him with a job, and he became a dam supporter. Ostapuk moved to Page, Ariz., to work at the Navajo Generating Station, a coal-fired power plant that uses water from the lake and employs mostly members of the surrounding Navajo Nation. "It may sound like blasphemy in some circles," says Ostapuk, "but by providing local jobs, Lake Powell has allowed Native Americans to keep their cultural connections, too." Page depends on Glen Canyon Dam for its economic existence - powerboat tourism as well as hydroelectric and coal power. 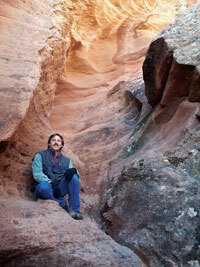 When the Glen Canyon Institute was formed, "some people (in Page) were laughing," Ostapuk says. "I took it seriously right from the beginning." That's when he joined Friends of Lake Powell. Lakes Mead and Powell combine to store about 50 million acre-feet of water - roughly three years' worth of the river's erratic flow. Models show that global warming could exacerbate this cycle. More heat in the atmosphere means more energy, and that means more variability - drier and wetter years in the Rocky Mountains that are the Colorado's source. "Rich (Ingebretsen) has 100-percent convinced himself that the recent drought is the new normal," Ostapuk says. "But if climate theories hold true about greater variability," between wet years and dry years, "then all the more reason to store the water." The day before, the boaters ran a dozen major rapids in Cataract Canyon under a blazing sun, capped off by an ephemeral summer storm that pelted the campsite with rain and sand. After sunset, a full moon rose, illuminating the canyon walls in a shaft of bluish light as Ingebretsen and Ostapuk addressed the group. Ingebretsen spoke of friendship and cooperation, and Ostapuk concurred. "We're on the same page on probably 80 percent of the big issues," Ostapuk said, citing green tourism, the value of wilderness and water conservation, and the need for even more water for the river's desiccated delta. "But we'll never agree about the dam." Jim Rossi is a San Francisco-based writer.